NOTE: Saturday, January 28th’s lantern lit ski and snow shoe program is cancelled. Sorry everyone. It will resume when the trail conditions and the park Intepreter’s health improves. Nearly 80 old-fashioned kerosene lanterns will illuminate a 1-mile trail for a unique and memorable experience. 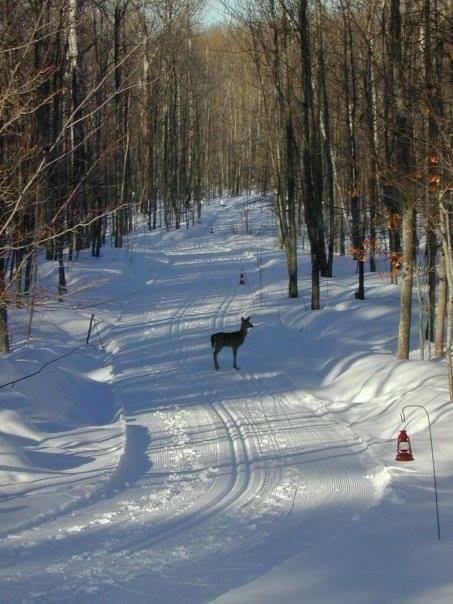 The ski trail is track-set for classic skiers, while snowshoers can make their own trail adjacent to the lighted loop. Stop about halfway around the loop at the warming shelter, where the park naturalist will have a campfire going and provide some refreshments. The ski trail has an “easy” difficulty rating; however, skiing or snowshoeing at night is always a challenge. The lanterns are on the Superior Trail immediately across the street from the ski hill entrance. Porcupine Mountains Wilderness State Park will host lantern-lit ski/snowshoe events every Saturday in January and February from 6-9 p.m. (6:30 pm in February) Visit www.michigan.gov/gogetoutdoors for additional events. If there is severe weather or if the temperature is 5 degrees or below, these programs will be canceled. Cancellations will be posted at the program meeting location or call 906-885-5206 to check in advance. Great Night for the Lantern Lit Trail. The weather is nice, good snow conditions and the trail looks great. Tina Melonie Christina and then I see this tonight when I got home...good omen!? How fun! I didn't know this was a thing. How much is this and are there snow shoes available?